Servo Controlled Voltage Stabilizers offer a reliable and tested economic solution to inconveniences caused by voltage fluctuation. Our SCVR is a real investment because the elimination of the inconveniences means a reduction in costs and an increase in productivity. 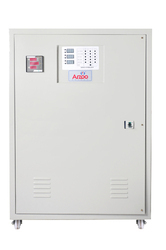 We are a prominent supplier of Servo Control Voltage Stabilizers. These are fully loaded with comprehensive features stupendously designed for correcting the voltage and reduce the electricity bills. They are noteworthy productive with its mountainous constructions. The Main aim of the Automatic voltage controller is to continuously observe the incoming voltage variations and maintain the optimum output voltage at all times by doing voltage corrections as and when required. We are the manufacturer of highly efficient automatic voltage stabilizer. AVC Stabilizer allows the elimination of overvoltage and voltage drop phenomena in an electrical network, thus allowing the electrical system to be free of faults and provides desired output voltages. Owing to years of practice, we are providing a wide range of AVR Stabilizer. We offer this at nominal costs. The offered range of AVR stabilizers is made utilizing high grade raw material and modern machinery in strict compliance with the international quality standards. Our years of market knowledge and experience have enabled us to establish ourselves as a famous manufacturer of quality approved Air Cooled ASCVS. . These air cooled stabilizer are ideal for protecting electrical appliances from voltage fluctuations. Our air cooled stabilizers are fabricated using latest technology and provide hassle free performance. In order to keep pace with the never-ending demands of customers, we are involved in offering a wide range of Air Cooled ASCVS. Air Cooled ASCVS offer total reverse phase cut-off which successfully controls the fluctuating input current voltage. Owing to our expertise in the domain, we have been able to offer Air Cooled Automatic Servo Controlled Voltage Stabilizers. We make use of latest technologies to manufacture these stabilizers that comply with the international quality standards. We offer Single Phase SCVS Air Cooled stabilizers, which are the rugged and highly functional stabilizers. These are commonly available in natural as well as forced air cooled range. Appropriately suitable for CMM, CNC machines, cold storage units, textile & spinning mills, CT Scan, MRI machines, food processing equipment, restaurants, retail outlets and other office applications, these best quality products insure the safety and protection of electrical appliances. 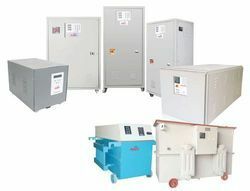 We are presenting a comprehensive range of Air Cooled SCVS. We offer Air Cooled SCVS that are used for lowering the breakdown of electrical equipment from voltage fluctuation. These products are highly applauded among our patrons for their optimum performance, long functional life and flawless design. 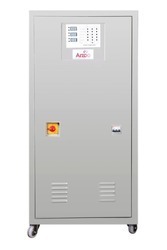 Our Single Phase Air Cooled Servo Controlled Voltage Stabilizer has been designed to give a constant output voltage for single applications with stability. We are engaged in producing Air Cooled Servo Stabilizer. Our single phase stabilizer is stringently checked in compliance with set industry norms. 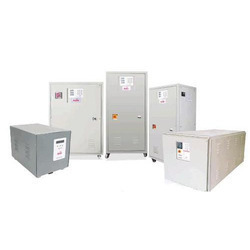 We offer an exclusive range of Three Phase Air Cooled Servo Controlled Voltage Stabilizer, which is precisely engineered as per the requirement of an individual. Our Air Cooled Stabilizer is widely demanded in the various industrial and commercial sectors. We have established ourselves as one of the prominent manufacturers and suppliers of Air Cooled Servo Stabilizer. We manufacture our products, keeping in mind the needs of the domestic and industrial Uses. We ensure to eradicate the blow of today’s harsh power supply and damaging the electrical environment. These Air Cooled Servo Stabilizers significantly control high or low input voltage to prevent electrical instruments from damaging. It has manufactured using highest grade copper and other raw inputs. Air Cooled Servo Stabilizers offer total reverse phase cut-off which successfully controls the fluctuating input current voltage. Wide input voltage range trip conditions. Air Cooled Voltage Stabilizer is necessary for smooth functioning In spite of Voltage fluctuations; Electricity board cannot ensure constant Voltage to the consumer because of the long and inadequate distribution lines and irregular load patterns on distribution transformers. The provided Air Cooled Voltage Stabilizer uses an advance electronic controlled servo motor concept to govern a motorized variable transformer. In order to ensure their quality and durability, these stabilizers are tested on various parameters. It is a reliable product for stable supply. Its fast correction ratio against quick voltage fluctuation ensures trouble free operation for high precision Electrical & Sophisticated electronic equipment. Sitting in fully Ventilated sheet metal cabinet sprayed with lacquer finish paints. These stabilizers are extensively acknowledged in the market for its immense performance, high temperature resistant, power capacity and safety. These are manufactured by utilizing choicest quality raw material that are rigorously tested and acquired from the trustworthy merchants in the market. These are ideal for constant power supply to machines, elevators and other home products. We are highly engaged in offering a broad range of Digital Stabilizers to our clients. The products are of high quality range and are highly appreciated in the industry. The products can be easily availed at the competitive price. Our products are used for household as well as industrial purposes. This is easy to use and does not get affected due to constant working in fluctuating power supply. These are widely appreciated by our customers due to their various features like cost effectiveness, noiseless functioning, and sturdy construction and require low maintenance. Offered range of machine is manufactured from best quality input factors and adopting latest methods of fabrication. We are known for reliability and continuous improvement in the field of automatic voltage controller. The provided voltage controller is highly appreciated in the market for its various quality features like optimum performance and is used to maintain the desired voltage and to reduce the breakdown of electrical equipment due to low/high voltage. The Automatic voltage Regulator is used to regulate the voltage. It takes the fluctuate voltage and changes them into a constant voltage. The fluctuation in the voltage mainly occurs due to the variation in load on the supply system. The variation in voltage damages the equipment of the power system. Electronic Stabilizers have been specifically designed to safeguard large electric equipment against voltage fluctuations. These Stabilizers provides complete power protection for sensitive electronic appliances like industrial refrigerator, air conditioners. Special radiators are provided for effective cooling of the system. Under the stern command of our trained personnel, we are presenting a pioneering collection of Electronic Stabilizer. Presented product is purchased in a collection of dimensions, sizes and other such provisions to select from. The presented product is specifically made-up at highly avant-garde fabricating unit following industry defined guidelines. The offered variety can also be purchased from us at the industry-leading rates. Linear Type Stabilizer acts like a voltage divider. With the valuable assistance of skilled team of professionals, we are engaged in offering an extensive range of high-quality Linear Type Stabilizers. Our offered Linear Type Stabilizers are developed by making use of optimum-quality material. 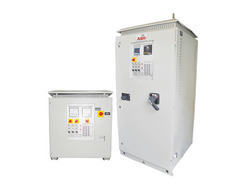 These Oil Cooled Voltage Stabilizers come with remote monitoring & control. We offer these stabilizers in different specifications and dimensions at most affordable rates to satisfy the needs of clients. Highly demanded in the international market, the offered stabilizer is used in various residential and commercial establishments. We ensure delivery of high-quality stabilizer within time frame at the desired destination, with the help of our wide distribution network. Oil Cooled Stabilizers is one of the best Servo Stabilizer. 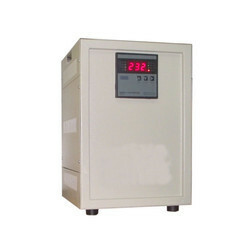 Unbalance oil cooled servo controlled voltage stabilizer is suitable where the voltage fluctuation is very high and unpredicted. To meet the demands of the clients, our company is instrumental in offering excellent quality range of Oil Cooled Servo Controlled Voltage Stabilizer. 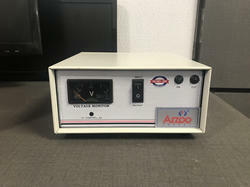 Our 3 Phase Oil Cooled Servo Controlled Voltage Stabilizer works very efficiently and accurately at any conditions. Keeping in mind diverse requirements of the clients, we are offering a quality tested array of Oil Cooled Servo Stabilizer. The Oil Cooled Servo Stabilizer we offer is widely demanded by the clients for their precise use. Servo Stabilizer is an automated device which corrects voltage flux resulting in accurate and constant voltage supply to all equipment. It comes in both Single Phase and Three Phase. The power supply can become dirty before it enters our house. So a stabilizer is a thing or device used to maintain something or a quantity steady or stable. stabilizer is made up of many different components that work through electric wires like thermostats and adopters. Through the use of all these different parts and components, stabilizers have the ability to measure and restrict power input into machines like pumps or an induction stove and power outputs being produced by machines like a generator or a UPS. Balances the unbalanced load supplies. Stabilizers are able to judge the difference between power input and output and then work accordingly. Highly effective for power and voltage controlling, these stabilizers are manufactured utilizing quality-assured materials that are obtained from the reliable vendors of the industry. 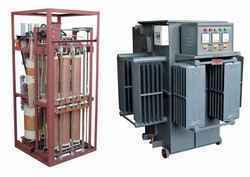 We are the well-known Static Controlled Voltage Stabilizer Manufacturer and Supplier in India. 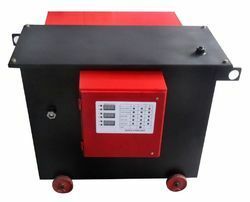 The Static Voltage Stabilizer, offered by us, efficiently regulates the fluctuating input and output AC voltage. Our Static Voltage Stabilizer is majorly used for diverse Industrial Equipment, across the country. With Very High Speed of Correction provides perfectly stable output even under severe conditions of unbalanced voltage conditions. Ideal to protect the electrical and electronic equipment’s from high and low voltage. Our high quality static voltage stabilizer provides protection against fluctuations in voltage as well as ensures rapid voltage correction. The static stabilizer offers a reasonable improvement on slow servo controlled stabilizer as well as other static tap changing stabilizers. This technology does not cause di/dt problems as it does not switch the power path. Offered voltage stabilizer is tested on various defined parameters for make certain its flawless dispatch. With the support of our highly skilled and experienced professionals, we are able to offer a premium quality Static Voltage Stabilizer. The offered stabilizer helps in controlling voltage fluctuations & provides desired constant output voltage. Voltage stabilizer is designed for maintaining the stable voltage level to provide a constant supply in spite of any fluctuations or changes in supply in order to protect the home appliances. Voltage stabilizers are used for maintaining a stable voltage supply to the load such that the home appliances can be protected from over and under voltages. We are the leading supplier of 10KVA Servo Controlled Voltage Stabilizer made available to our clients at competitive prices. 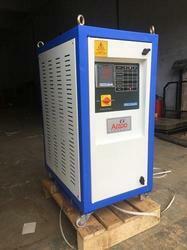 We are providing 10KVA Servo Controlled Voltage Stabilizer.